Heat the oil and fry the onion and garlic for around 5 minutes. Add the flesh from the courgette or squash and cook for another 5 minutes. In the meantime, put all the rest of the ingredients into a large bowl (half the fake parmesan) and except the egg. Put the courgette or squash 'bottoms' in an oven dish and fill the dish with boiling up to midway the courgette/squash. Drain the onion, courgette mixture and add to the bowl and mix well. Leave it to cool slightly and add the egg. Or you can leave the egg out, if you like it to be vegan. The egg only makes the filling slightly firmer. Top with the rest of the fake parmesan. 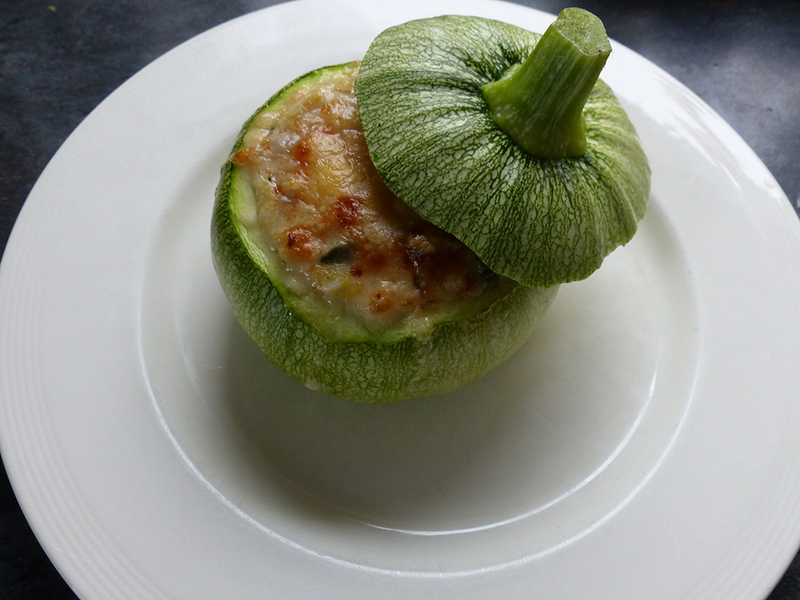 Put in a 180C (gas 5) oven and bake for around 30 minutes or until the courgette/squash is soft.